We are comparing Best Hop-on Hop–off Boat Tour Amsterdam Prices from leading ticket suppliers and Try to find you Cheap tickets prices on the market. The Hop-On Hop-Off boat is excellent for friends, families, couples or individuals who would like to explore the Centre of Amsterdam at their own pace. With the 24-hour pass you can join the red riverboat at any time and cruise through unique architecture and historic UNESCO World Heritage sites. You can choose to cruise for the entire loop from Central Station or jump off at your preferred point of interest. Relax onboard, take pictures or learn about Amsterdam's interesting history and many stories from a multilingual audio guide or local guide. There are 13 places around central Amsterdam where you can join or leave the cruise. Stops are within a short walking distance of the city's main attractions such as the Van Gogh Museum, Anne Frank's House, Vondel Park, The Red Light District and Artis Zoo. This pass can be used at any time within the tickets 24-hour validity so you can take your time at your favourite attractions. Hop-On Hop-Off river boats are aimed at visitors who want the flexibility explore the city on their own itinerary but also the security of a semi-guided tour. With a 24-hour pass you will be able to see a lot of the city in one day and hop-off at whichever sight you fancy. Your Experience With Best Hop-on Hop–off Boat Tour Amsterdam? Climb aboard the city sightseeing boat and use your 24-hour pass to discover Holland's ‘Venice of the North'. Take the Hop-On Hop-Off Riverboat to explore Central Amsterdam and with a multilingual audio guide to teach you about the city. See Amsterdam's most famous landmarks whilst cruising through the canals. Have the flexibility to board and disembark the Riverboat at any of the 13 stops. Visit Amsterdam's top museums, attractions and legendary Red Light District. What Best Hop-on Hop–off Boat Tour Amsterdam Includes? Multilingual Audio Guide (English, Dutch, German,Spanish, French) or English/Dutch speaking onboard guide. 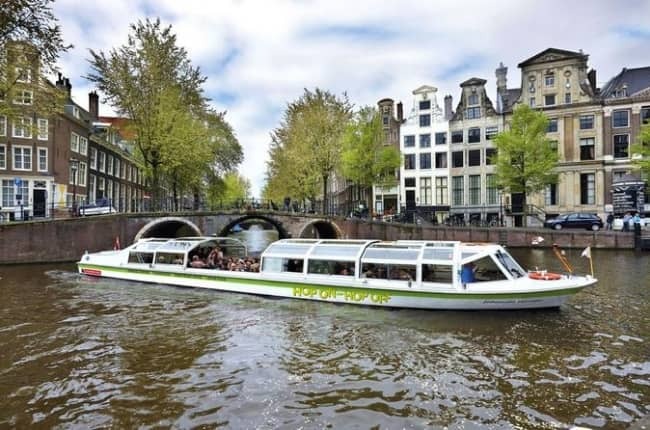 Hop-On Hop-Off Boat stops: Central Station – Amsterdam Lookout Tower – Heineken Experience – Anne Frank's Hour (Keizersgracht and Jordaan) – Vondel Park/Leidseplein – Hermitage Museum – Amsterdam City Hall – Maritime/Nemo Museum – Return to Central Station. Travelers Reviews about Best Hop-on Hop–off Boat Tour Amsterdam? The Hop-On Hop-Off cruise has a 4-star rating from nearly 500 reviews on TripAdvisor and Viator. On Get Your Guide the river cruise has a good feedback, 4.4 out of 5, from customer reviews. Travelers have said the tour offers a great service and is very convenient for getting around the city. The 24 hour pass is active from its first use. Depending on the supplier, cancellations made without charge from 24 hour -7 days in advance.